So: sockwise there has been small but significant progress since my post at the beginning of July. 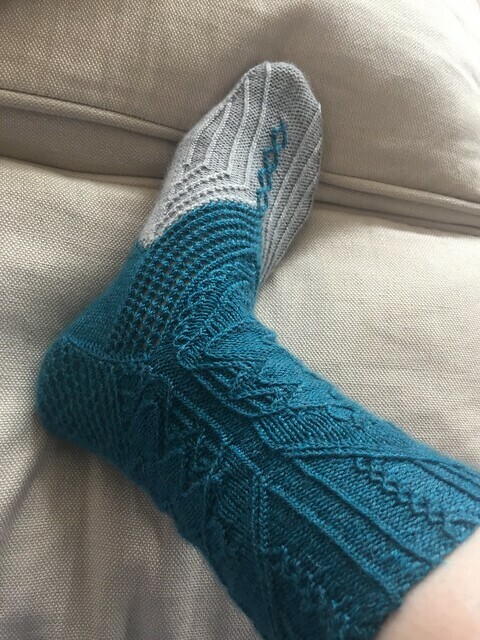 I finished the first Twisted Soul sock, blocked it and… it pretty much fits! I won’t lie, it’s a snug one, but blocking did relax it a little bit. Also the end result is just so extraordinary, I can’t not be pleased with it. What I haven’t done yet is cast on for the second one, but I’m 90% sure that I am going to now (with, granted, ever so slightly mixed feelings about that!). It’s going to be really non-matchy colour-wise – I’m using the leftover gold from my Twylla socks for the leg/heel etc, and then the end of that same petrol blue from the first sock for the foot/toe. The reasons for not casting on yet are a) finishing off my Driftwood the other day (still delighted with myself about that) and b) doing some secret unbloggable deadline knitting (more on that before too long). I’ve got a few long journeys coming up that are ripe for sock-knitting but I fear the Twisted Soul socks are a bit complex for knitting anywhere other than my lounge, so I’m planning to wind up the blue and speckled aqua Dandelion Katie sock yarn I got from Pomfest the other day and make some simple but pleasing stripey toe-up kickers while I’m out on my travels (the There and Back Again socks would work better in two solid colours, I’ve decided). If you’d like to see what some other lovely knitters are up to this month when it comes to sock-knitting, have a look at my online friends: Paula , who has just finished some gorgeous striped socks (Spin a Yarn), Katherine, who is on a road trip at the moment and focussing on gorgeous knitted shawls right now (Fiber and Sustenance) and Stefanie, who is taking a blog hiatus this month and next but you should still check her out (Wooly Cakes and Wooden Spoons). And if you’d like to join in then please do – get in touch with any of us and we’ll talk through the system (which is, erm, to post on the first Thursday of the month and link through to the rest of us – there we go, done!). IN OTHER NEWS: I am in the latest Pom Pom Quarterly pomcast! Yes that’s right, if you listen through until 55.37 you can hear my dulcet tones saying “I’m Kat” (as part of the helping-knitting-muggles-learn-to-wind-yarn challenge) – a big moment! You can’t tell from the recording, but my team is the one at the beginning of the ‘cheerometer’ and we TOTALLY won. I’m also in the photos from that part of Pomcast Live – I particularly like how over-excited our team is about the 1-inch ball I’m holding up (which I think is a success given that we only had 30 seconds). Thank you for reading! If you enjoyed this post then please use the buttons below to share, like, or leave me a comment – I’d love to hear from you. I love, love, love that sock! It is absolutely stunning!!!! One day I wanna be just like you 😀 I bet it’s lonely without its pair but will be so happy when united 🙂 Congrats on your muggle challenge and being in the Pom Pom Quarterly. How exciting!!! I’ll have my post up shortly! Your sock looks sooo beautiful! I completely spaced out on Thursday with all the travel (the funny thing was, I did a post that morning but didn’t even think about the fact that it was Thursday!) but I’ll be back with socks next month. Also squeee you’re in Pomcast! I will listen out for you!! !